We are proud to produce Energy Star® qualified windows and doors. Look for the Energy Star® logo which represents high efficiency windows and doors that help to reduce your home energy costs by 7 to 12 percent, collect less condensation and reduce noise from outside. 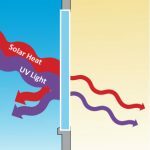 In the winter, LoE coated glass helps keep your home warm and cozy by blocking heat loss through windows while allowing the sun’s heat inside. In the warmer weather, LoE coating blocks the sun’s harmful UV rays, protecting the interior of your home and keeping your furniture from fading, while at the same time allowing in more visible sunlight. LoE coated glass is simply the best way to help minimize energy costs and maintain comfortable temperatures inside your home all year round. At ALLSCO we are proud to offer Cardinal LoĒ-180™ glass which offers the highest energy rating performance on the market. LoE glass retains more interior heat than ordinary glass, helping to maintain a comfortable temperature. LoE glass filters out harmful UV rays and reduces solar heat gain. Argon is a clear, non-toxic gas used to fill the space between the window panes. Heavier than air, Argon offers greater resistance to heat loss and reduces exterior noise. 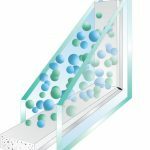 Our Energy-Plus combination of LoE Coated Glass, Argon Gas and the Warm-Edge Super-Spacer® is engineered to double the insulating ability of the space between the panes. Air space is filled with Argon gas. 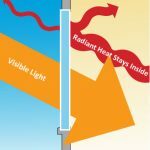 Less heat loss translates into more energy savings. from your home than a typical metal spacer. 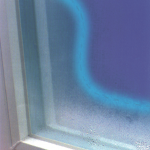 To keep window condensation moisture off the glass, windows need to have the warmest possible temperature at the edges of the glass. 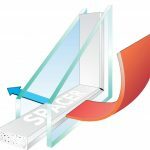 Super Spacer® effectively blocks the heat escape path for premium energy efficiency while eliminating condensation, which can lead to harmful mold growth around your windows.